Howard Lindzon is an active guy, and that’s just how he likes it. 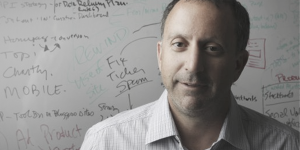 A serial entrepreneur, Lindzon is best known for creating two companies: WallStrip, an online video show that took a satirical approach to financial news and was acquired by CBS in 2007, and StockTwits, a venture-backed social network for traders and investors. But Lindzon is a very active investor, too, with dozens of angel investments to his name, including Buddy Media (acquired for nearly $700 million by Salesforce in 2012) and LifeLock (which staged a successful public offering). Lindzon is also the cofounder of Social Leverage, a seed-stage investment fund that typically invests between $100,000 and $500,000 in companies. Among its investments is Kensho Technologies, whose data crunching software attracted funding from Goldman Sachs in November; ApplePie Capital, an online loan business focused on franchise funding (StrictlyVC profiled it here); and Robinhood, a new brokerage firm whose lets customers trade stocks without paying commission. To learn more about Robinhood — and get Lindzon’s take on some other things — we chatted with him recently. People love the idea of commission-free stock trades. Where does Robinhood go from here? How does it unseat established competitors? [Founders] Baiju [Bhatt] and Vlad [Tenev] are super smart. They have just enough experience to attack the millennial market and not so much that they are scared of the industry walls. First, they had a great launch. I can’t imagine the complications of launching an app that has to work almost perfectly because the company is regulated and trying to establish the trust of its customers, whose money is moving through its system. They also had to keep their heads down and go through the long process of dealing with the SEC and FINRA and audits. But they’re fearless with respect to the past and dealing with hard problems. The way they win in my opinion is by disrupting customer acquisition. Ameritrade and Etrade are public companies. Go look up what they spend a year on marketing. It’s insane. I also think it’s much easier for Robinhood to get into some form of “robo-advising” later on [meaning providing portfolio management online with minimal human intervention] than the other way around. Many in the industry still associate you with Stocktwits and with angel investing. Fewer know about Social Leverage. I started Social Leverage with Tom Peterson, who has been my pal and partner since graduate school at ASU. Originally, back in 2008, we started a holding company inspired by Betaworks that would invest in and operate startups, but we learned that we’re best-suited for just investing, using social leverage as a means for accelerating startups. Right now, we’re raising our second fund and Gary Benitt has just joined as a GP. In 2010, we invested in Gary’s startup, [a maker of customer-service help desk applications called] Assistly, which was acquired [in 2011] by Salesforce [for $50 million in cash]. Gary just left Salesforce, and we’re thrilled to have his experience and passion for entrepreneurs and startups. He’s also in San Francisco, which is great. Which raises another point: You live in San Diego and still manage to invest in great new companies. How? Aren’t most of these deals syndicated based on proximity? Before San Diego, I lived in Phoenix for 20 years. I was the only in my peer group who was not doing real estate deals. Around 2004, an Apple Store opened across the street from my office, and the world I lived in — hedge fund, trading, with Windows and a Bloomberg [terminal] — changed. I just quit cold turkey, believing that the financial world would just go web and browser. The trend away from the terminal and Windows in the financial world is five years behind the rest of the disruption – still. But with that switch, I started thinking differently about the world; I started thinking longer term about bigger trends. In 2006, I met the founders of Golfnow.com in Phoenix – they were the OpenTable for tee times – and I went pretty much all in. Comcast acquired them a few years later. I also met the founders of Lifelock, a Tempe [Arizona] company and again invested and wow, did they deliver. Long story short, it doesn’t matter where you live. You’ve written about Silicon Valley’s insularity. If you could point to one thing the Bay Area is getting wrong right now, what would that be and why? The Bay is doing very little wrong. The area is being swept up in the biggest boom of all time, so the only thing they might be getting wrong is diversification. Phoenix went on a long real estate boom from 1991 to 2008. That did not end well.